Washington DC is a great place to visit throughout the year. While there are endless things to see and do in this vibrant city, you can pack a lot into a two-day visit. Explore the world-famous museums and national memorials on the National Mall, see the iconic government buildings (the White House, U.S. Capitol, and Supreme Court) and check out the local food, arts and culture, history, or shopping destinations. Weekends are often busy, so be sure to check the schedule of events and know what to expect. Here is a two-day itinerary to help you plan ahead, determine what you really want to see and set your own personal priorities. Note, you will need to book a few tours in advance. 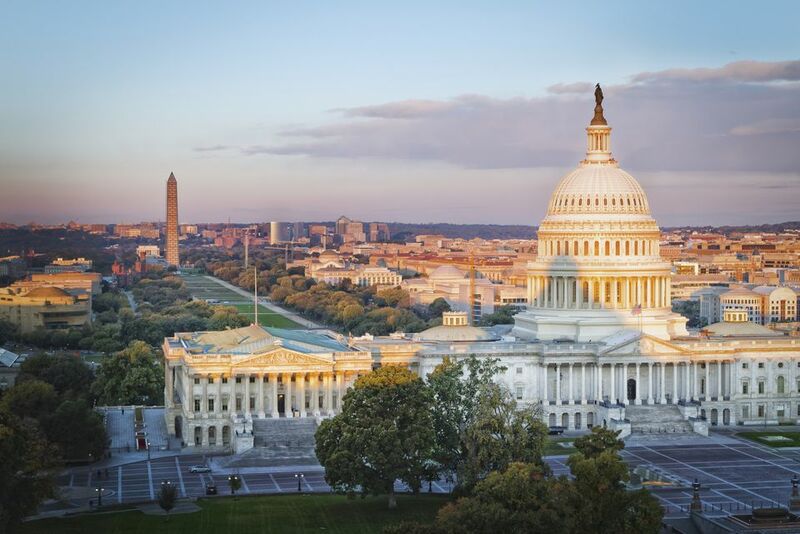 Arrive early to take a guided tour of the U.S. Capitol and learn about the history and architecture of the iconic building and the U.S. legislative branch of government. See the Hall of Columns, the rotunda, and the old Supreme Court chambers. From the visitors’ gallery, you can watch bills being debated, votes being counted, and speeches being given. Tours of the Capitol are free; however, tour passes are required. Book your tour in advance. Hours are Monday-Saturday, 8:30 a.m. - 4:30 p.m. The main entrance is located at the East Plaza between Constitution and Independence Avenues. The Capitol Visitor Center has an exhibition gallery, two orientation theaters, a 550-seat cafeteria, two gift shops, and restrooms. Tours of the Capitol begin with a 13-minute orientation film and last approximately one hour. The Library of Congress is a "must see" attraction as it is a beautiful neoclassical building and the world’s largest library containing more than 128 million items including books, manuscripts, films, photographs, sheet music, and maps. It is open to the public and offers exhibitions, interactive displays, concerts, films, lectures and special events. Walk east to Eastern Market, which is especially lively on weekends as part of the street is shut down for vendors to sell crafts and food. Enjoy some fast casual food or walk a few blocks farther to 8th Street SE (Barracks Row) where you will find a wide range of great restaurants. After lunch, take the metro to the Smithsonian Metro Station to visit the National Mall. Ten of the Smithsonian museums are located on the National Mall from 3rd to 14th Streets between Constitution and Independence Avenues, within a radius of about one mile. There is so much to see and all of the museums are free. The most popular are the Air and Space Museum, Natural History Museum, and American History Museum. Choose the museum that interests you most and spend a few hours exploring. At the National Air and Space Museum, see the original Wright 1903 Flyer, the "Spirit of St. Louis," and the Apollo 11 command module. At the National Museum of Natural History, take a look at the Hope Diamond and other gems and minerals, examine the massive fossil collection, visit the 23,000-square-foot Ocean Hall, see a life-size replica of a North Atlantic whale and a 1,800-gallon-tank display of coral reef. At the National Museum of American History view the original Star-Spangled Banner, an 1815 tavern sign to Helen Keller's watch; and historic and cultural touchstones of American history with more than 100 objects, including the rarely displayed walking stick used by Benjamin Franklin, Abraham Lincoln’s gold pocket watch, Muhammad Ali’s boxing gloves and a fragment of Plymouth Rock. If you are an art lover, visit the National Gallery of Art which displays one of the largest collections of masterpieces in the world including paintings, drawings, prints, photographs, sculpture, and decorative arts from the 13th century to the present. Take the metro from Smithsonian Station to McPherson Station and then exit toward Lafayette Square. Take a short walk to the White House (1600 Pennsylvania Avenue) and enjoy a glimpse of the President's home and office. Public tours are available but must be arranged in advance. Georgetown is one of the oldest neighborhoods in Washington, DC, and is a vibrant community with upscale shops, bars and restaurants along its cobblestone streets. The area is not accessible by Metro, so take the DC Circulator Bus from Dupont Circle or Union Station or take a taxi. M Street and Wisconsin Avenue are the two main arteries with plenty of good places to enjoy happy hour and dinner. You may also take a walk to Washington Harbour to enjoy the Potomac Waterfront views and popular outdoor dining spots. See a guide to the Best Restaurants in Georgetown and Georgetown Bars and Nightlife. The national memorials in Washington DC are spectacular historic landmarks and "must see" attractions. They are very spread out (see a map) and the best way to see them all is on a guided tour. Book your tour in advance. If you would prefer to take your own walking tour of the memorials, note that the Lincoln Memorial, the Vietnam War Memorial, Korean War Memorial and the World War II Memorial are located within a reasonable walk of each other. Likewise, the Jefferson Memorial, the FDR Memorial, and the Martin Luther King Memorial are located near one another. Take the Metro to the Chinatown/Gallery Place Metro station. Penn Quarter is a revitalized historic neighborhood that has become one of Washington DC's hottest destinations for dining and entertainment with a wide variety of restaurants, ranging from fine dining to family-friendly eateries. After lunch, walk a few blocks to 10th and E Streets NW. Washington DC. Ford’s Theatre, where Abraham Lincoln was assassinated by John Wilkes Booth, is a national historic landmark and an interesting place to visit. A short talk is given by a National Park guide every half hour. Advanced timed tickets are required. Reserve tickets in advance. On the second floor of Ford's Theatre, you can see the box seat where Lincoln was sitting when he was killed. On the lower level, the Ford's Theatre Museum displays exhibits about Lincoln’s life and explains the circumstances of his tragic death. The Ford’s Theatre Center for Education and Leadership is housed across the street and features two floors of exhibits about Lincoln's life and legacy. Allow at least two hours for your visit. After your visit, take the Metro at Gallery Place to Arlington National Cemetery. (You will have to change to the Blue Line at Metro Center). Arlington National Cemetery is truly a special place to explore and should not be missed during your visit to Washington DC. You may walk the grounds on your own or take the interpretative tour. Stops include the Kennedy gravesites, the Tomb of the Unknown Soldier (Changing of the Guard) and The Arlington House (Robert E. Lee Memorial). Allow at least two hours to explore the grounds and be sure to wear comfortable walking shoes. P.O.V. is the rooftop bar at the W Hotel, known for its spectacular views of the White House and the city's historic monuments. The bar features an extensive selection of wines and cocktails and is a popular destination for happy hour. It is a great place to end your trip while taking in the panoramic views of the city.